WASHINGTON, DC--(Marketwire - September 14, 2007) - Construction has topped out on The Wentworth House at North Bethesda Center, a $70 million, 18-story, 312-unit luxury apartment building with a Harris Teeter Grocery Store at its base. Designed by Dorsky Hodgson Parrish Yue Architects (DHPY), The Wentworth is the first building in the 32-acre mixed-use, transit-oriented development adjacent to the White Flint Metrorail Station in North Bethesda, Maryland. LCOR is the master developer. As the first in this nearly $900 million mixed-use development, The Wentworth sets the standard for subsequent buildings. When completed, North Bethesda Center will be the largest development of its kind in the Washington, DC area, with 930,000 square feet of office space, 1,275 residences, a 320-room full-service hotel and more than 200,000 square feet of retail. Designed to appeal broadly -- to young professionals through empty nesters -- The Wentworth embodies a 24/7 urban lifestyle and sense of community. A grocery store is a key component in creating a vibrant urban neighborhood. Wentworth residents will enjoy the convenience of a 65,000 square foot, two-level Harris Teeter and Café at the foot of their building as well as their own private club room, exercise facility, business center, and library. 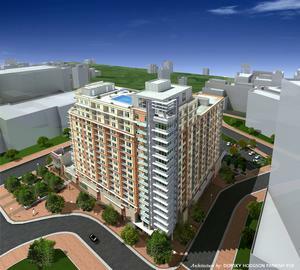 "North Bethesda Center will be a self sufficient community in the midst of a highly developed suburban corridor. The Wentworth exemplifies the level of quality and creativity that must be in place to successfully launch this type of large-scale, transit-oriented urban development model," says Sandy Silverman, Partner, DHPY. The club room and swimming pool deck above the 18-story wing and a "sunset" terrace above the 15-story wing will offer spectacular views. DHPY has integrated an environmentally green roof above the store, supporting LCOR's commitment to sustainability and enhancing resident views from units above it. While the building is clad in a three-color brick grid pattern to establish a strong residential character and visually reduce its overall massing, a fourth brick color is used on the entire 18-story corner, announcing the residential entrance. Both the residential and café entrances open onto a central park that will be framed by additional residential buildings. The Wentworth House and Harris Teeter store are scheduled to open in July 2008. Dorsky Hodgson Parrish Yue (DHPY) is a national architectural and planning firm with additional expertise in interiors and environmental graphic design. The firm is active in today's industry trends -- like transit villages, main streets, town centers and environmentally sensitive and sustainable design. The firm is a member of the United States Green Building Council (USGBC) and has 12 LEED Certified professionals.